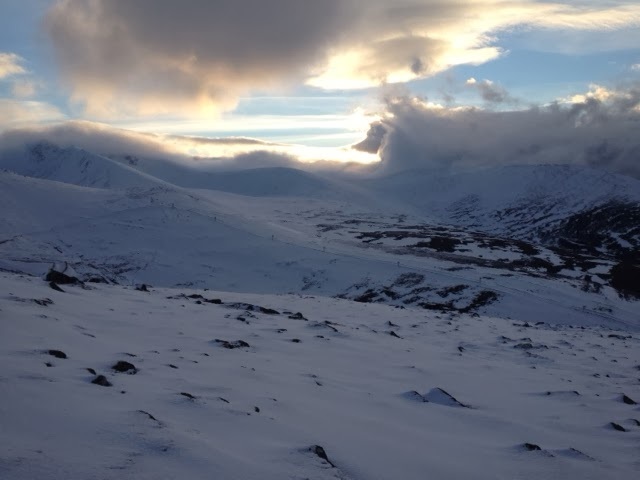 This week I was working on a Lead to Lead week at Glenmore Lodge with Nick and Adam. It has been a wild week in the mountains with more snow coming in and burying the routes on everything apart from and easterly aspect! We still had a great week though and Nick and Adam are now well on their way to being fully self sufficient winter climbers. I now have a few days off before being a student myself on an American Avalanche Association Level 2 course so I am hoping from more snow! 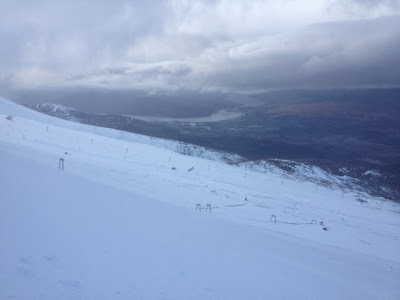 I have just finished a week of Advanced Winter Skills at Glenmore Lodge. Over the week we spent time navigating including night nav, developing our avalanche awareness and looking at some ropework to over come some of the obstacles we might find in the winter mountains like cornices. The week gave us a real mix of weather which was great for training in. Thanks to the team for their company and I hope they enjoy the rest of the winter. Last week was the start of my season at Glenmore Lodge and I started off working alongside Bill Strachan on a Winter Climbing week. I teamed up with Nigel and Andy who were getting their first taste if climbing let alone winter climbing! The week started with some poor weather so we spent Monday looking at snow anchors and then visited the Ice Factor on Tuesday. Wednesday was cold and windy and we made it to a very buried Hidden Chimney for some vertical swimming. 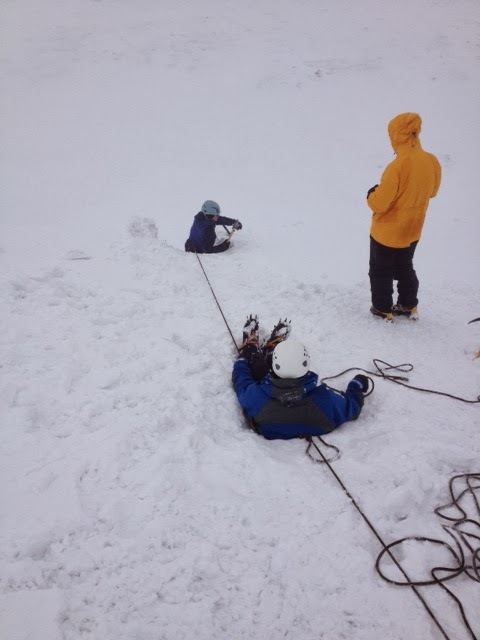 Thursday had us at Cha-no to climb Dukes Rib where the conditions were much better. Finally on Friday we climbed a direct version of Twin Ribs. A great week with improving conditions and great company and by the sounds of things two new coverts to winter climbing! Having a look at the snow! I was working for the Mountaineering Council of Scotland at the weekend on Avalanche Awareness Courses along side Heather and Max. On Saturday the Gondola did not run as it was too windy, this lead to a very wet day walking up underneath the gondola. However we still found some layers in the snow and looked at Avalanche Avoidance. Sunday was a very different day with the gondola running we could get high and look at the snow pack above the freezing level. 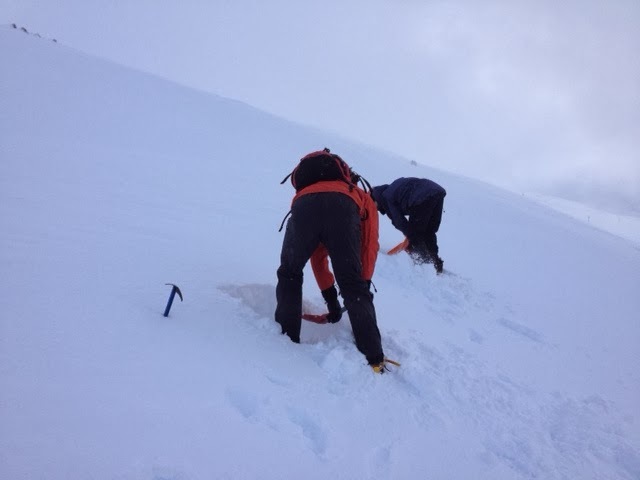 There was lots of wind slab around and all sorts of layers in the snow, a great day for teaching avalanche awareness. I am back at Glenmore Lodge from Jan 6th for most of the season so will post about conditions in the Cairngorms.